Somehow, Gameloft created a video game gaudier than Paris Hilton's Diamond Quest, and we love it. For years, PopCap has ruled the bedazzled puzzle scene with Bejeweled 2, an addictive time waster that challenges you to match sparkly jewels of the same color and make them explode. 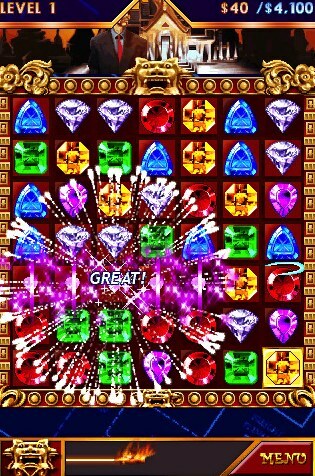 We thought it was going to dominate the iPhone until we played Diamond Twister, Gameloft's Bejeweled 2 knockoff that takes the aforementioned formula and introduces a cheesy narrative, a healthy selection of modes and the ability to play horizontally or vertically by tilting the device, all for a very affordable $4.99. Consider us smitten. We knew we were in for something ridiculous as soon as we laid eyes on the title screen, which features a humongous, glittering diamond. Our impression of this game only improved when we discovered that Gameloft paired the entertaining, rock busting gameplay with a story. From what we gather, you play as a jewel thief that jet sets across the world (in this case, Sydney, Cairo, Paris, New York, Rio, Shanghai, Moscow and Bangkok) to steal jewels from shady looking characters. Even better, you have a bearded mentor that has funny sound clips. Wait until you hear this dude's accent. It's so bad, it's excellent. Each location has its own art style and music, which breaks up the monotony, and instead of scoring points, the goal is to reach a specified amount of money before time runs out. Past that, story mode is ridiculous, since your method of "stealing" these precious gems is to play Bejeweled. Gameloft mixes things up with some interesting power-ups, one of which destroys an entire horizontal line, once you eliminate three gems. Despite these new additions, the game plays mostly the same as its competition. Don't expect to be blown away, especially with the unnecessary replays. Sorry, but we don't want to see our winning moves. Diamond Twister's eight Challenge modes are cool, but mere variations on the same principle. For example, Endless Mode lets you play until you lose, Magic Stones tasks you with uncovering hidden jewels and Reveal Letters forces you to search for letters to spell words. No matter which you choose, they mostly boil down to (once again) playing Bejeweled. Doesn't matter if it's letters or panels. You play almost exactly the same way, albeit faster or more aware of the clock. After playing this, however, it's hard going back to Bejeweled 2. PopCap did a great job bringing its popular puzzle game to iPhone, but Gameloft annihilates it with Diamond Twister, delivering a the same, enjoyable gameplay but with added modes and a cheaper price. Save yourself some money and immediately download your new addiction. What's Hot: Excellent graphics, cheesy voices, tons of modes, great touch screen controls, fun music, you can play horizontally or vertically, only costs $4.99. What's Not: Too much loading, corny replays of winning moves.